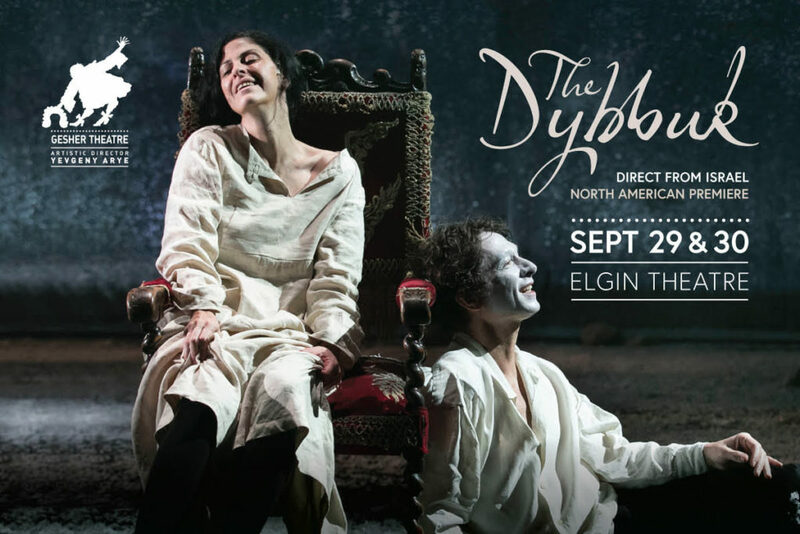 Gesher Theatre’s version of S. Ansky’s classic play The Dybbuk is visually arresting and impeccably acted and directed. Roee Chen’s adaptation radically cuts the play that premiered in Warsaw in 1920, streamlines the action and removes any taint of wrong-doing from the main male character. It also adds a chorus of comic ghosts who only help to make the scenes of possession more disturbing. Chen’s adaptation is not as close to the source as was Anton Piatigorsky’s adaptation for Soulpepper seen here in 2015. Nevertheless, the result is a production with greater theatricality and far more impact. The difference between the Soulpepper production and Gesher Theater’s is apparent immediately from the set. Whereas Soulpepper took a realist approach, Gesher’s is obviously symbolic. Designer Simon Pastukh covers the stage opening, the back wall and the legs in plastic curtains spatter-painted in grey. This gives the impression that we are in the same situation as are the main characters Hanan and Leah of being in one world and glancing into another. Pastukh’s set uses geometry symbolically. Hanging above the playing area stage right is a huge globe representing the moon, the heavenly body most referred to in the text. Standing on the floor stage left is an enormous, nearly cuboid, ceilingless glass box that periodically rotates. Throughout the action the glass box represents the known while the area outside the box under the moon represents the unknown. When the plastic curtain rises we see Hanan (Israel Demidov) on the top of a ladder leaning against one wall of the glass box where the rich merchant Nachman Sender (Doron Tavori), father of Hanan’s beloved Leah (Efrat Ben-Tzur) is attending a synagogue service. The ladder against the box creates the shape of a triangle between the sphere of the moon and the cube of the box. Hanan, of course in already caught in a love triangle between Sender’s love for Leah and his own. When Sender announces in the first scene that he has found a husband for Leah, Hanan is caught in a second triangle as the man who feels he should be Leah’s husband versus the man who will be. By isolating Hanan from the congregation in the box as an outsider looking in, Arye immediately establishes visually what Ansky’s does verbally with all the discussion in the yeshiva about Sender’s rejection of all suitors for Leah. Here there are no yeshiva students as in Ansky and here Hanan is no student of Kaballah. Chen’s adaptation presents him simply as a young man hopelessly in love who for unknown reasons is cruelly despised by Sender. Chen has Sender make fun of Hanan as a “gimp”, to use the English surtitle translation, even though we learn that it was Sender’s throwing Hanan down the stairs that caused him to break his leg. In Chen’s version, Hanan does not die of a broken heart while clutching a copy of the Book of Raziel, a book of magic spells. Instead, Hanan enters the glass box when Sender announces that he’s found a husband for Leah and a dispute arises in which the congregants chase Hanan outside and beat him. He drowns ignominiously face down in a puddle. In doing this, Chen completely alters our perception of Hanan. No longer is he a lover in such distress that he is driven to the dark arts, an explanation of why he should become a dybbuk, a malicious spirit, who possesses Leah. Here he is an innocent, faithful lover killed by Sender’s friends because is represents a threat to Sender’s authority. As the subsequent action makes clear, Hanan’s possession of Leah is in no way malicious but rather she represents the only loving home he has after death. This interpretation thus makes Hanan guiltless and the nature of Leah’s possession more complex. When we first see Leah confined inside the glass box with her father and grandmother (Fira Kanter), we can tell she restless with longing for Hanan, a condition made worse by Sender’s announcement that Hanan is dead and he has found a her a husband. When she wanders through a cemetery, she throws herself down on Hanan’s newly-dug grave in an effort to be chose to him. Thus when his spirit enters her body in a beautifully staged scene when she is in the mikveh, we do not feel that she has suddenly become possessed. Rather, Chen’s adaptation and Arye’s direction demonstrates how Leah’s psychological obsession naturally grows into possession. In fact, in this version of the tale we don’t really know whether her possession by a dybbuk is supernatural, psychological or symbolic. One reason for this is that Chen’s adaptation gives Leah a strong psychological reason for wanting to escape her father’s control. Arye shows us through Sender’s physically aggressive approach to Leah in his first scene with her that Sender is obsessed with dominating Leah, perhaps not merely in fatherly ways. When drunk Chen has Sender say he’d like to marry Leah himself. What the new adaptation makes clear is that Sender has rejected all previous suitors who are enamoured with Leah because their love represents a threat to his own. Thus, he chooses the dull Menashe (Ori Yaniv), who has never seen Leah before, over Hanan, who was childhood friends with her and whose requited love for Leah was all too evident. In the exorcism scene, Rabbi Azriel from Miropol (Gilad Kletter) has no need to call up the spirit of Sender’s friend, the now-dead Nisan, as in the original. Instead, Chen has Sender himself relate how he has broken his word to Nisan to unite Hanan and Leah. Chen’s greatest change to Ansky’s text, after his treatment of Hanan, is the addition of five ghosts as a type of Felliniesque chorus of the dead. While all the living characters are costumed in in black with white shirts or blouses, costume designer Stephanie Graurogkayte clothes the dead in riot of muted colours in whimsical styles. Chen’s brilliant notion is to include Leah’s own mother among these ghosts so that she acts as a counterpoise of kindness to the severity of Leah’s living father Sender. Other ghosts are one of Leah’s aunts, a distant relative and a watchmaker and his wife. Not only do the ghosts provide the main source of colour on stage but they are are also the main source of comedy. As one ghost sums things up, “ Better a dead husband you love than a living husband you hate”. Graurogkayte has imagined the ghosts as highly theatrical, all wearing white greasepaint to signify their deceased status. Thus when they help Hanan up after his beating and drowning, they paint his face white and he realizes that he is now one of them. The effect is to demystify the the afterlife and particularly to make it a place where all conflicts are past. The performances are universally superb. Israel Demidov is an intense, soulful Hanan. He shows that Hanan resents being a victim of injustice and does not want to cause Leah to become a victim herself. That is why in Chen’s version, none of Rabbi Azriel’s incantation or Sender’s prayers of atonement have any effect. It is solely Hanan’s decision to leave Leah because he doesn’t want to cause her harm. Efrat Ben-Tzur creates a fantastic portrait of Leah and is central in detailing how the ethereal Leah’s obsession with Hanan gradually turns into her welcoming his spirit’s possession of her. This does not mean that Ben-Tzur depicts Leah’s possession as natural. Indeed, her possessed Leah moves her body jerkily as if she were a marionette controlled by another force. Nevertheless, Ben-Tzur does show continuity between the unpossessed and possessed Leah in that Leah’s outward expression of despair has only deepened in moving from one state to the next. Doron Tavori powerfully portrays Sender as a crude, abusive egocentric man who believes that money is the cure to any problem. He is more inclined to think that Leah is feigning possession just to humiliate him in public than actually to be possessed. Even when he confesses his faults to Rabbi Azriel and prays for forgiveness, Sender’s previous actions have been so brutal that Tavori’s character still remains unlikable. 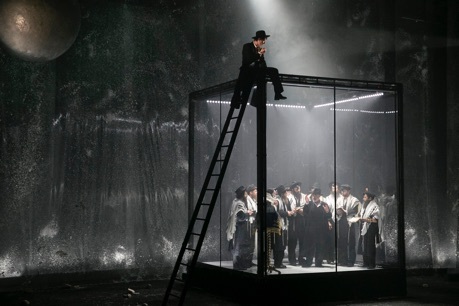 Among the rest of the large cast, Gilad Kletter makes an impressive Rabbi Azriel, carefully ramping up his wrath at the dybbuk inhabiting Leah until it becomes an almost uncontrollable rage. Fira Kanter is wonderful warm as Leah’s grandmother Frida (replacing the Nurse of the original), who is as outraged at Sender’s behaviour as Leah is, but whose help is restricted to comforting her unhappy grandchild. Ori Yaniv makes the most of the role of Menashe, the ineffectual groom that Sender has found for Leah. Yaniv shows that Menashe is essentially a good man. Though no match for the passionate Hanan, Yaniv makes us sympathize with Menashe’s acute embarrassment. Among the ghosts Neta Shpigelman as Leah’s mother, looking like the heroine of a silent Expressionist film, helps to make the Other Side appear attractive because someone who truly loves Leah is already there. Unlike many modern adaptations of classic works Roee Chen’s adaptation not only retains the essence of the Ansky’s story but invites us to explore its complexity and universality. Arye unfailingly creative direction moves from one visually and emotionally potent scene to the another. 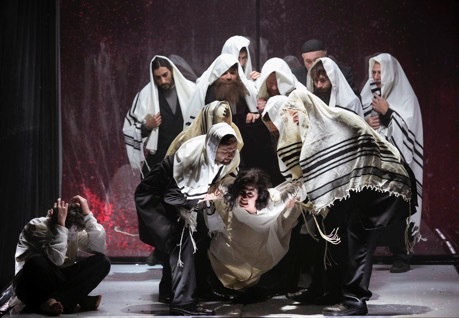 The Gesher Theater’s production of The Dybbuk played in Toronto only for two evenings, so all those who were able to see it should count themselves extremely lucky. 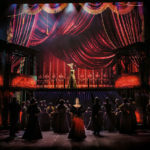 The production then moves on to New York City for two performances. Gesher Theater is like no classical theatre in Canada in that all classical plays are treated with a similar non-realist aesthetic and are acted by such a uniform, tightly knit ensemble. This is Gesher’s fourth visit to Toronto and it only makes one look forward to its next. If one is too impatient, one could always travel to to Jaffa to see it perform in its home theatre. 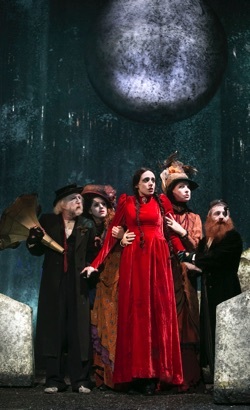 Photos: (from top) Efrat Ben-Tzur as Leah and Israel Demidov as Hanan; Israel Demidov as Hanan on the synagogue roof; the ghosts of the dead, Neta Shpigelman in red; Efrat Ben-Tzur as Leah possessed with Israel Demidov as Hanan seated in corner. © 2004—2019 Show One Productions Inc.